Clients need insight. This is the most important attribute next to the offering of pricing and product options. Travel agents position themselves to be travel experts when they have the proper training and knowledge to back it up. This is why continuing education is so critical, whether agents are in a classroom environment or experiencing the travel offering first hand. At Viking Cruise & Travel we do both. We’ve earned the Master Cruise Counselor and Accredited Cruise Counselor designations which are based on both classroom knowledge and travel experience. In addition, we’ve earned area and cruise line specialist designations and if you’ve read the blog and the product descriptions in other areas of the site you know just how many of these offerings of which we have first-hand travel knowledge.! Also, you know we cannot be expert in everything. We think it is important to narrow our scope in travel products and experiences to those that match our client’s interest, and of course, our own. However, we believe the key is being the best in what we choose. ! We learn about the travel products we are recommending through actual travel ( we love to travel with our clients), site inspections, vendor training programs, past customers, etc. Our insight is what our clients value us for...not a brochure or handout. Insight is our most valuable asset. As our client, you benefit from that.! In addition, accreditation builds trust and credibility. Whether it is a CTC, CTA, DS, MCC, ACC, etc., these certifications help to inform our clients they are dealing with a travel professional. Someone who has taken the time and made the financial commitment to be the best. ! It was 1869. 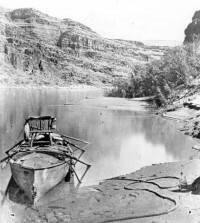 Ten men in four boats were about to embark on a journey that would cover almost 1,000 miles through uncharted canyons, and change the west forever. They were led by John Wesley Powell, a professor who had lost his right arm as an officer during the Civil War. Three months later only seven of the original company plus their one -arm Civil War hero-leader would emerge from the depths of the Grand Canyon at the mouth of the Virgin River. Powell became a national celebrity, as famous in the United States as Neil Armstrong would become after walking on the moon – a feat that occurred, coincidentally, exactly a century later.